The dust has barely settled since the 50th Anniversary special, and the BBC publicity machine is already getting into gear to promote the Christmas special, and Matt Smith’s final outing as The Doctor. From the look of things, aside from the battered top hat, he’s wearing exactly the same costume as seen in The Snowmen last year. Here is a couple of short videos I shot of the Eleventh Hour Panel, introduced by Matthew Sweet with Steven Moffat, Jenna Coleman and Matt Smith. 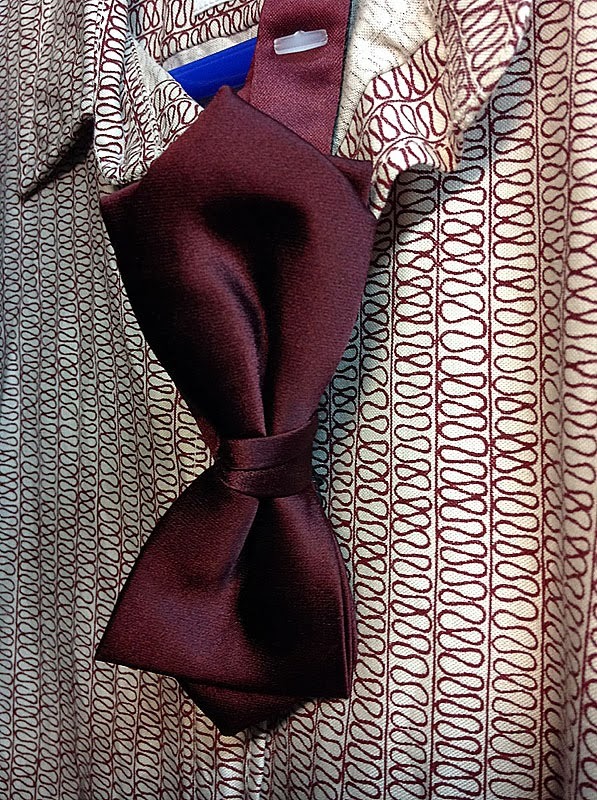 Next to that was a number of Paul Smith shirts in burgundy and blue. 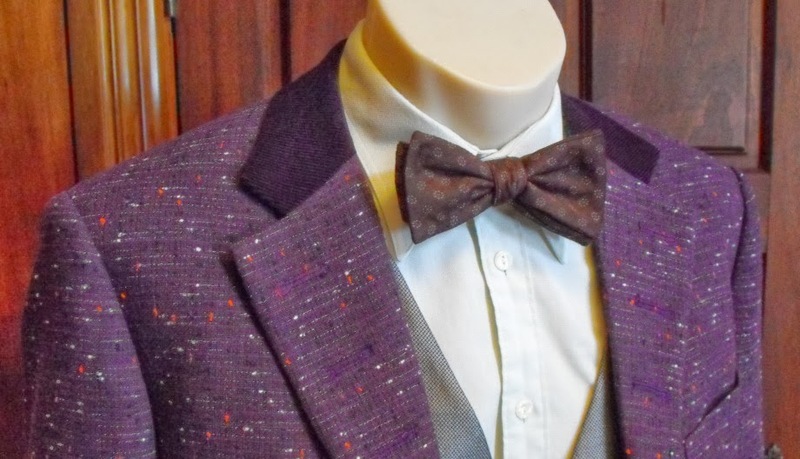 One of the burgundy shirts was dirtied down to accompany the distresses Donegal jacket and another was a replica. 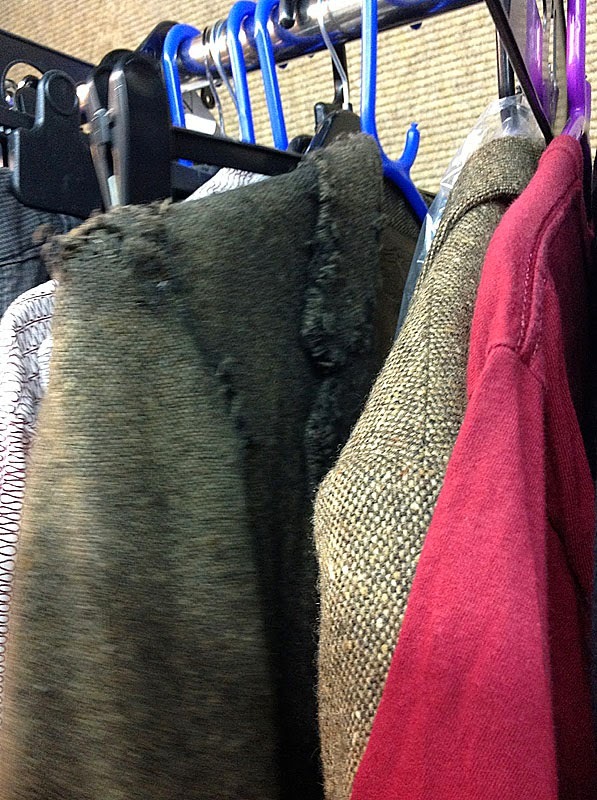 Speaking to the costume staff, these were made when original shirts were becoming thin on the ground, although none were used in the end for main shoots, though they may have been seen worn by stunt doubles. 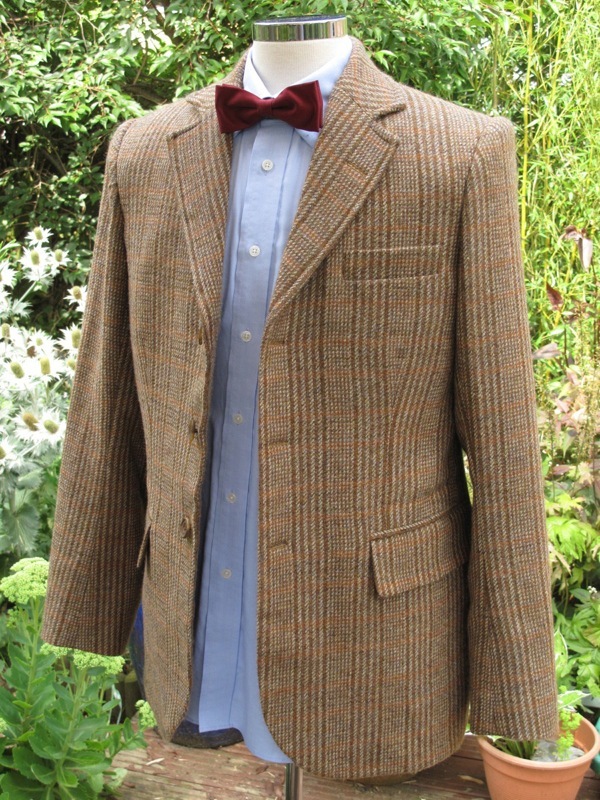 The Tenth Doctor was also there, and you can see what I found over on the Coat Blog. 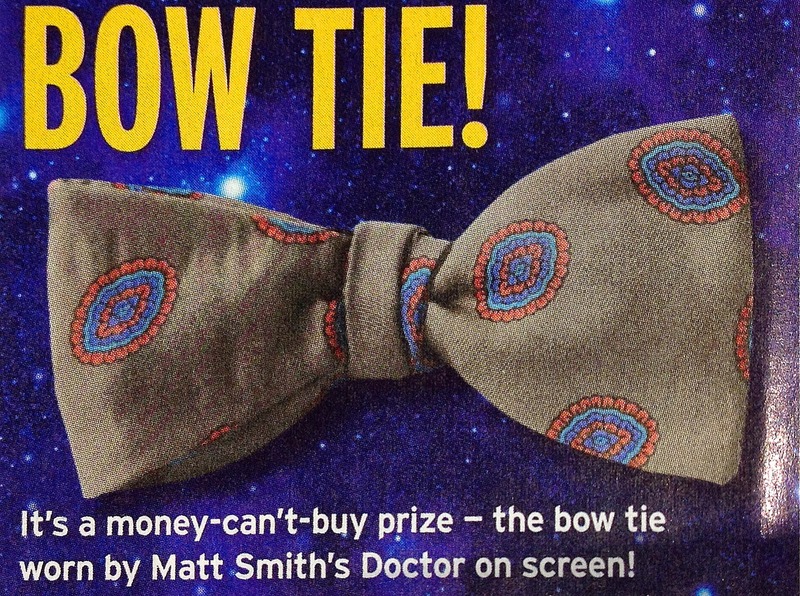 The final gem was the replica Christian Lacroix ties made for The Eleventh Hour. Here is a couple of short videos I shot of the Special Effects Panel, introduced by Dallas Campbell with Danny Hargreaves. 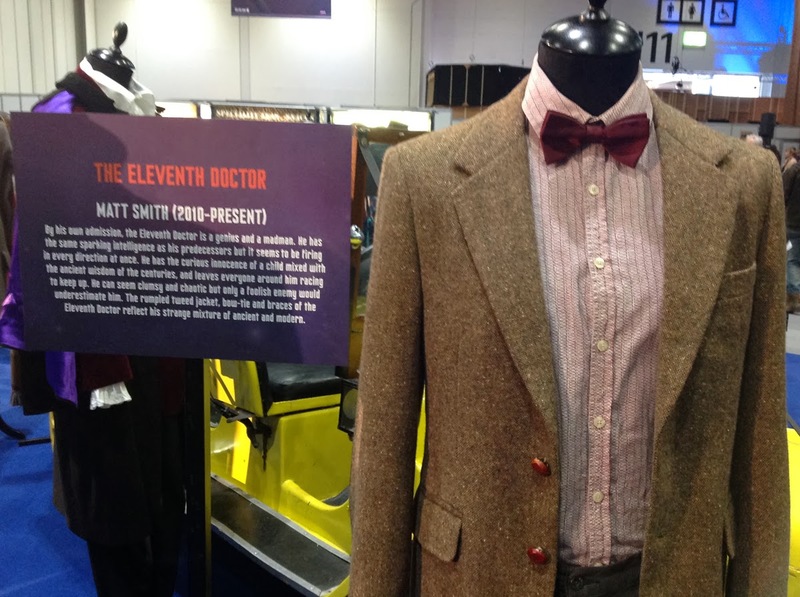 The Eleventh Doctor costume on show was straight out of the Experience, though it was originally displayed on the creepy waxwork of Matt Smith. 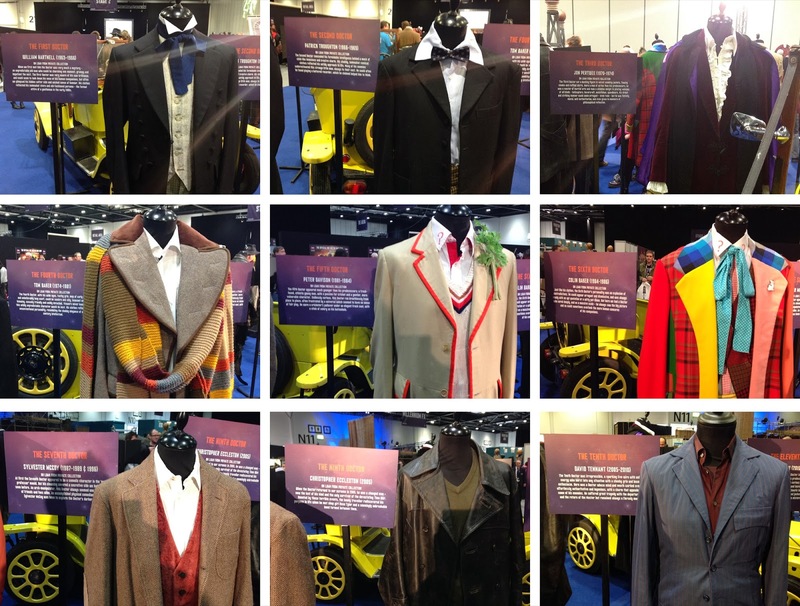 The Eleventh Doctor era was well represented, with several displays of costumes and set pieces. 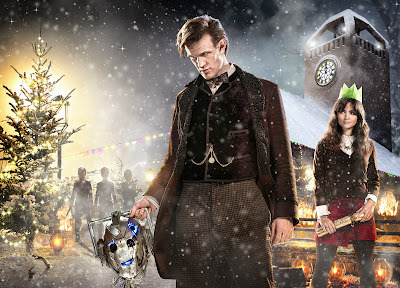 The centre-piece was from The Snowmen, which included The Doctor’s costume with top hat; Clara’s dress; Dr Simeon’s costume; all standing around the Great Intelligence snow machine. 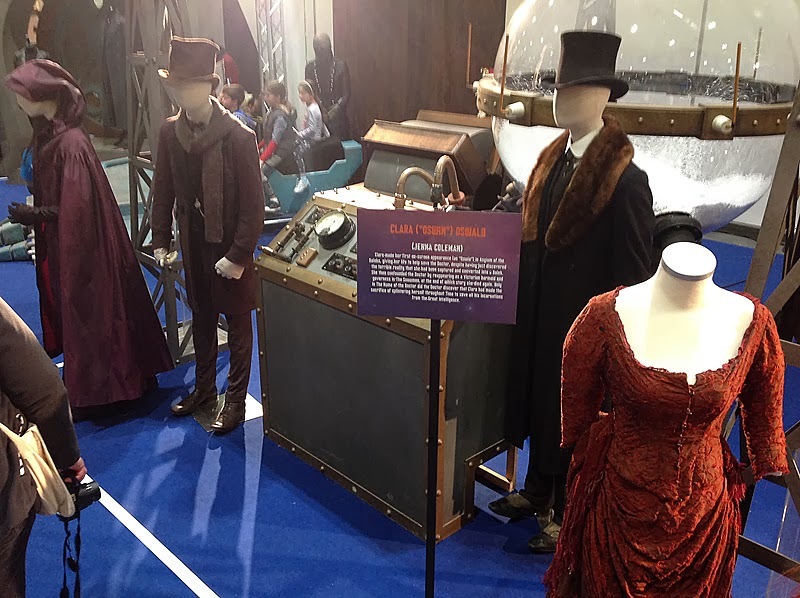 There were a handful of companion costumes on show, including Amy Pond’s kiss-a-gram outfit from The Eleventh Hour; her costume from The Hungry earth; Rory’s stag-do outfit from Vampires Of Venice; and River Song’s costume from The Pandorica Opens. There was also some prosthetic displays including a dinosaur from Dinosaurs On A Spaceship; and some background monsters from The Rings Of Akhaten. 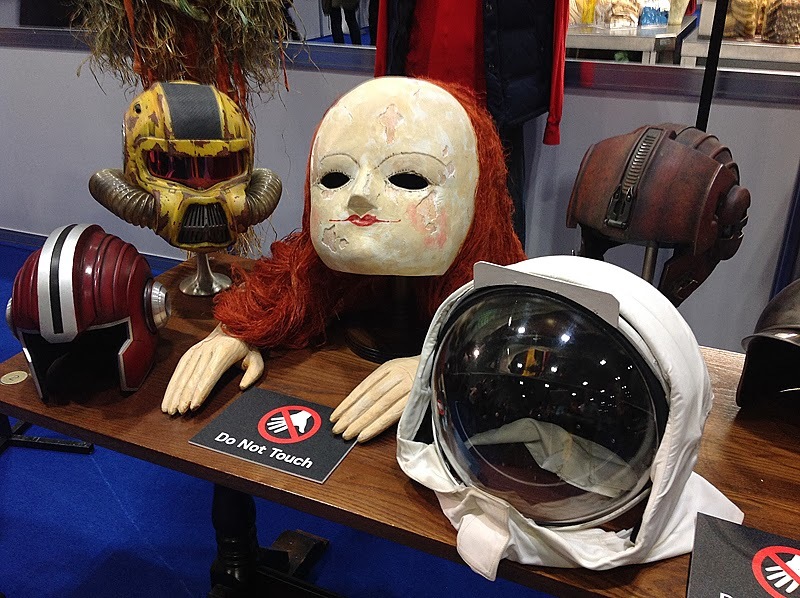 Finally there was a nice little mini display of masks and helmets, mainly from series six. 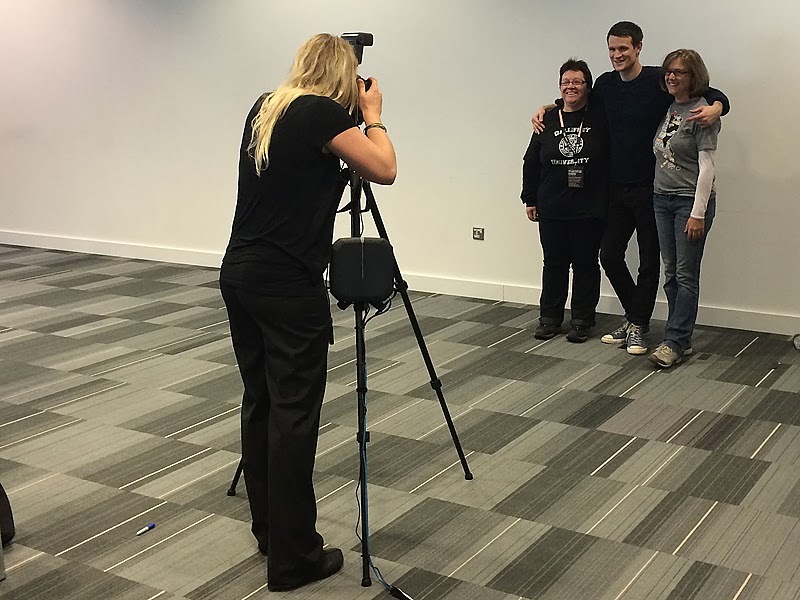 As with all big modern conventions, there are organised photo opportunities with the stars of the show, plus the uniquenchance to stand on the original TARDIS console room set. 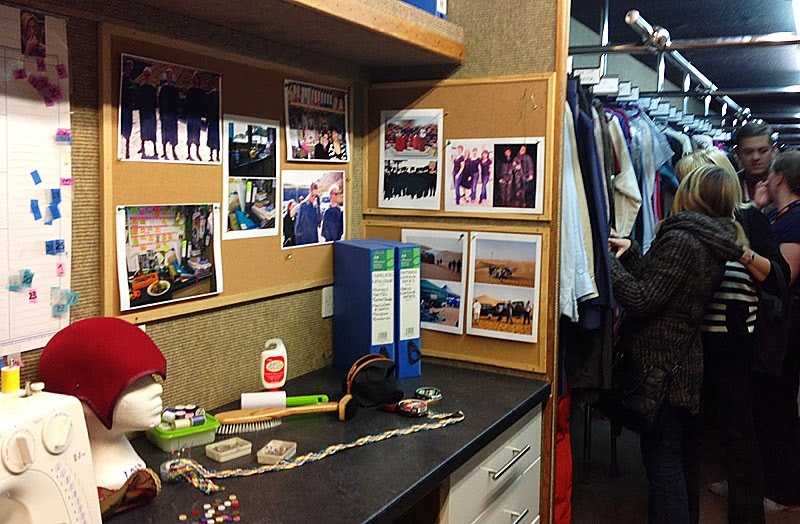 I’ve booked myself into a shot with Matt Smith and a second on the TARDIS set. Each ticket was an extra £15, so not cheap. 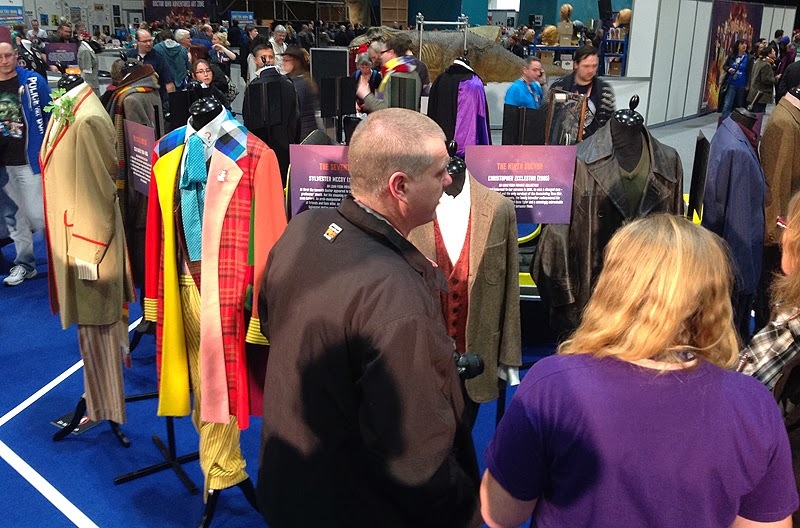 My first call was for the TARDIS set, but the queue was SO long it snaked around two other stages where interview sessions were going on! To be fair the organisers said it was taking longer than they planned, so they were happy for people to come back later when the queue had died down. 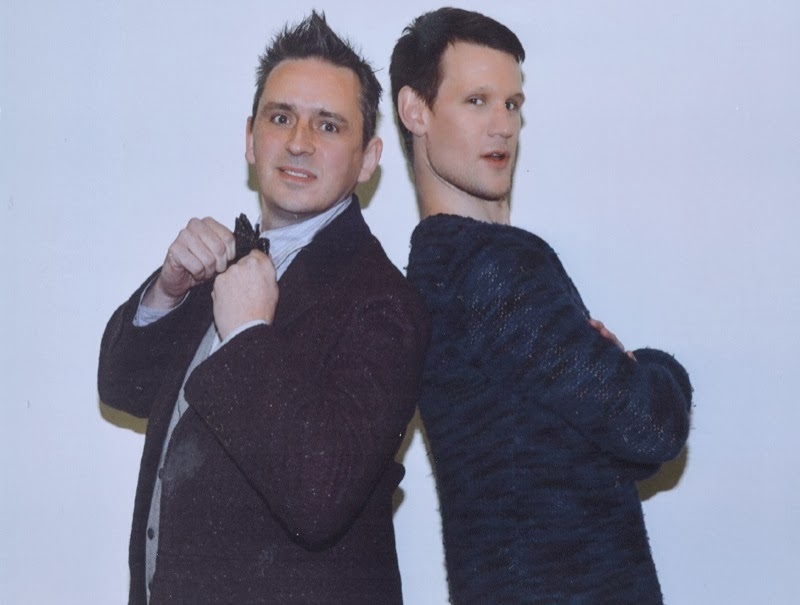 This was just as well, as I needed to get to the Matt Smith shoot upstairs. 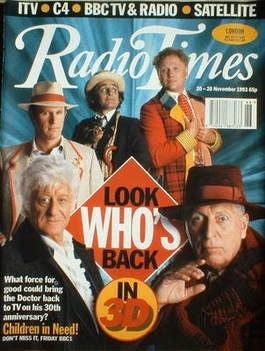 The queue for this was more manageable and moved quite briskly once Matt arrived. I did notice that it didn’t seem quite as professional as some of the photo shoots I’ve be too. The photographer had a standard SLR camera, using just a camera-mounted flash. It was being done against a bare white wall. 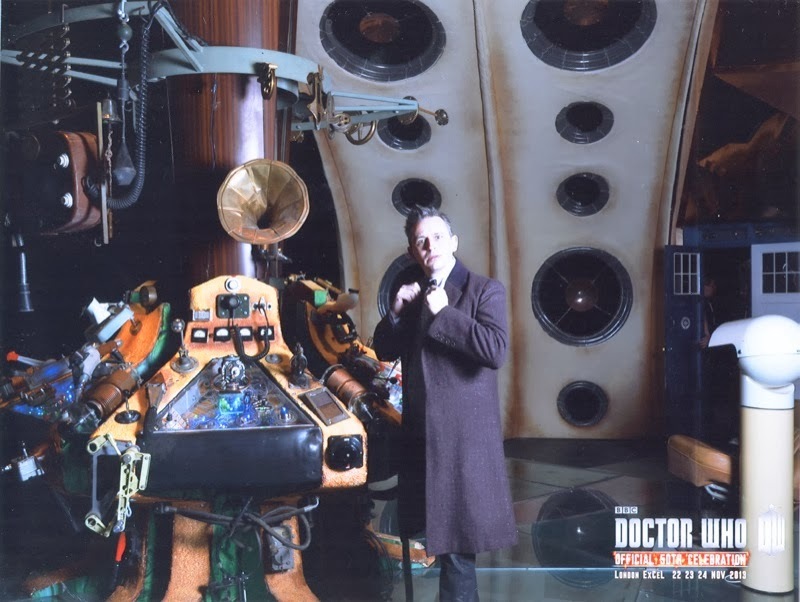 Once I was done there I went back to the TARDIS queue, which was just as long as before but I decided to stick it out as I was owed the shot. 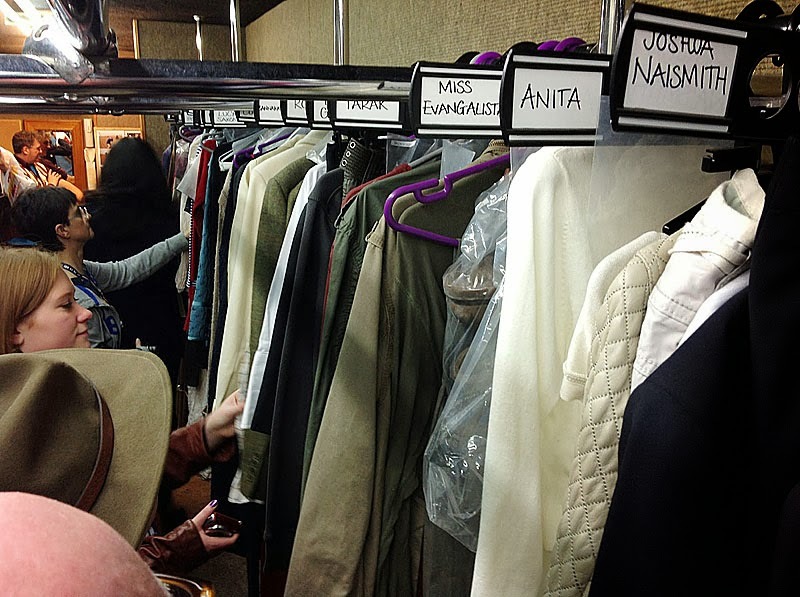 The set had been built in the far corner of the hall, wrapped in black drapes. I could see that as people came out from the shoot, they could wait around and pick up their photos almost straight away, which was good. What wasn’t so good was I saw at least five people having to be taken around again as their shots hadn’t come up to scratch. Hummmm. 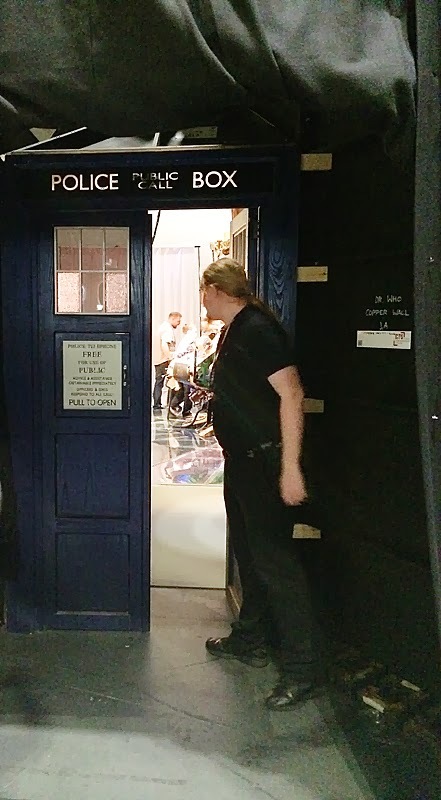 As you got closer to the front, the queue snaked around until you could see the exterior doors of the TARDIS, beyond which was the set. 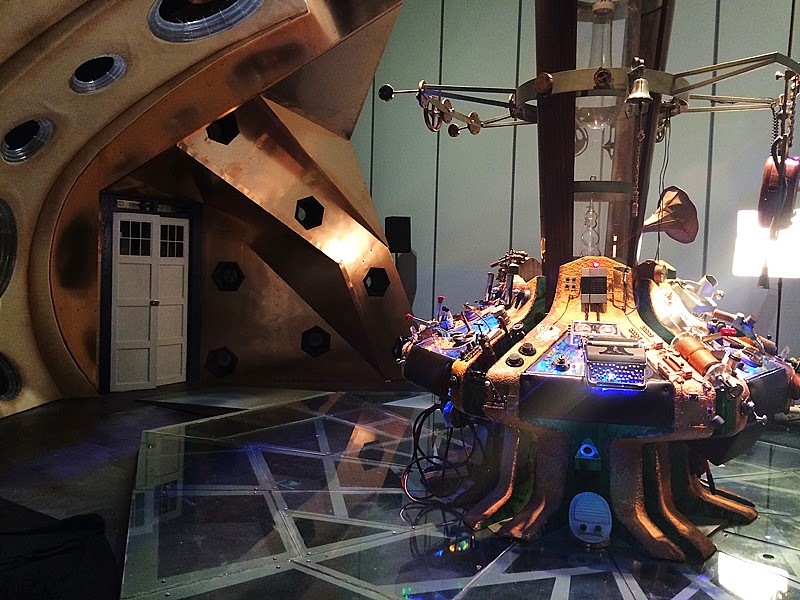 Finally I was invited forward and through the door to find the TARDIS console in front of me, and a small section of the wall behind it with the Police Box doors to one side. That was it. It was not the complete set. Before you could blink the shot was taken and you were ushered off to collect your photo. Once I got the print I was very disappointed. The photo was very dark, looked like it was lit from one single light bulb and badly framed. Frankly the sneaky shot I took above here was better than the official photo! Collecting the shots with Matt Smith, these weren’t much better. The harsh flash and wall didn’t work well together; again the print was very dark; and neither shot had Matt and me in the centre. I’ve scanned the pictures in and done a bit of retouching and reframing to improve them a bit. As a memento of the day, they don’t impress me. 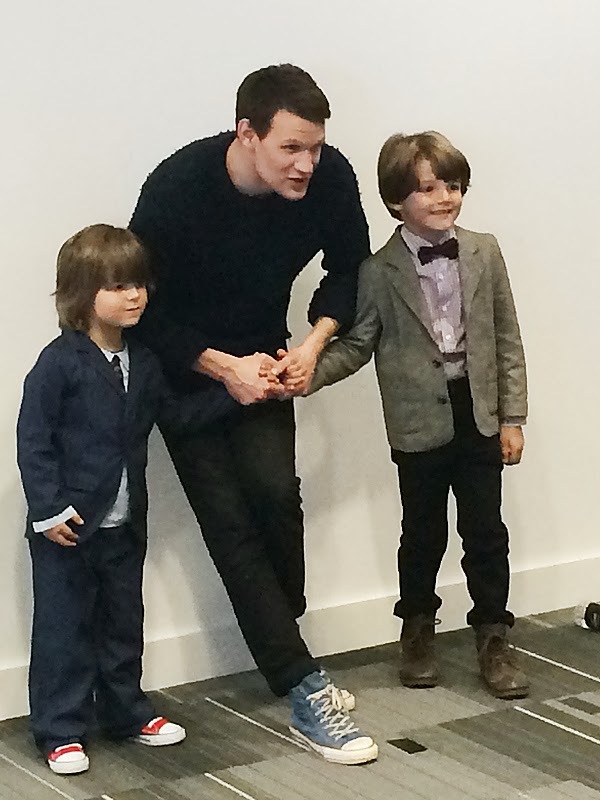 But at least Matt dressed a bit better than some of his previous photo calls. 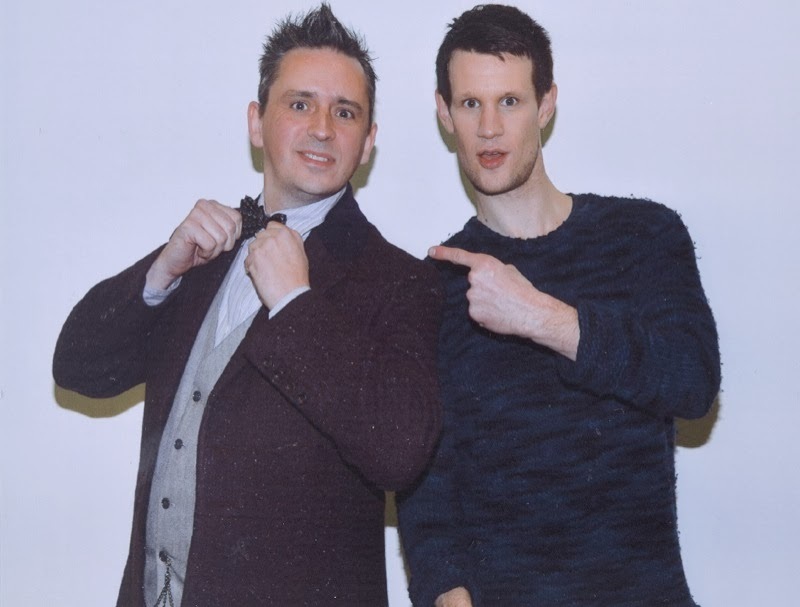 He scrubs up well in a nice cashmere frock coat for Doctor Who, but he dresses like a scruff to meet the fans! 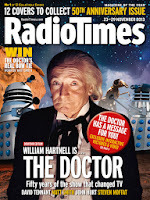 The Radio Times covering the 50th Anniversary is out today, and we well as having a DOZEN covers to choose from, it contains a treasure trove of articles and photos from the complete history of Doctor Who. 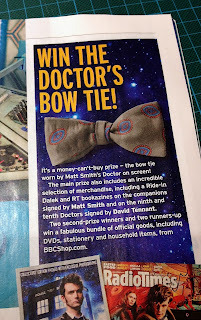 One thing that caught my eye was a competition to win a screen worn Eleventh Doctor bow tie! We do get a wonderful close up view of the bow tie to a level of detail you can’t see on screen or even on the high resolution costume portraits. I wonder who the lucky winner will be! 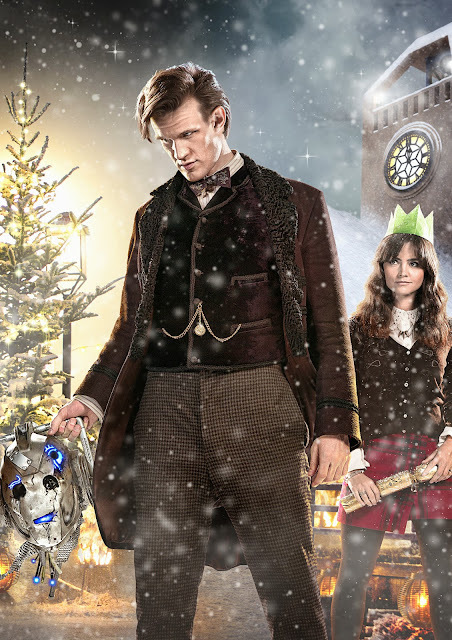 Here’s the full size version of the Eleventh Doctor’s cover. 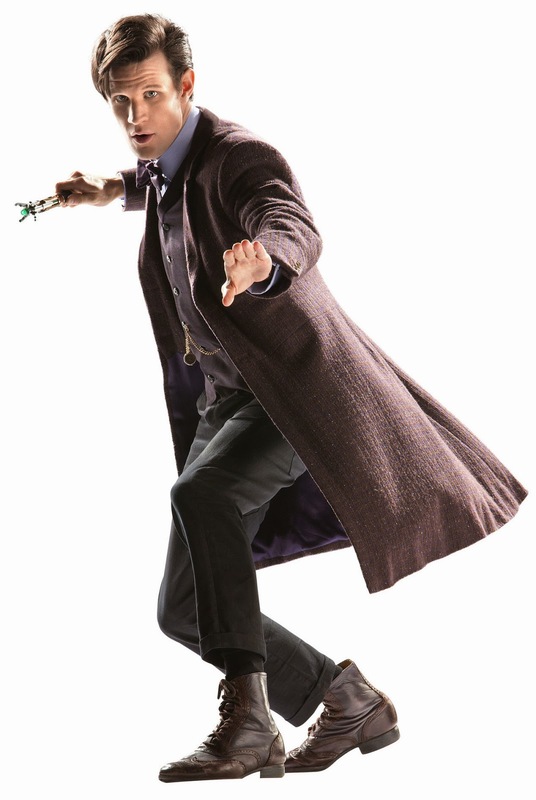 It’s less than ten days until the 50th Anniversary special, and the BBC have released some high resolution pictures of Matt Smith in full costume. 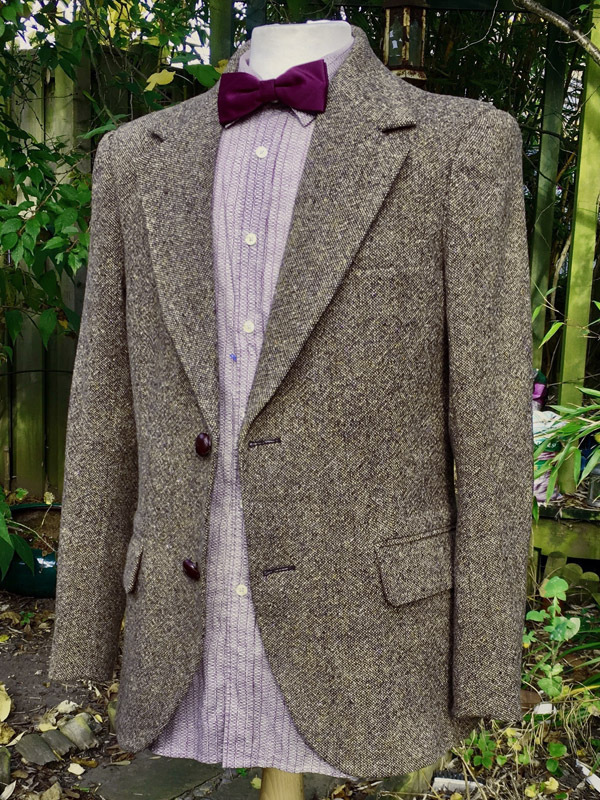 The cashmere frock coat gets its penultimate outing. 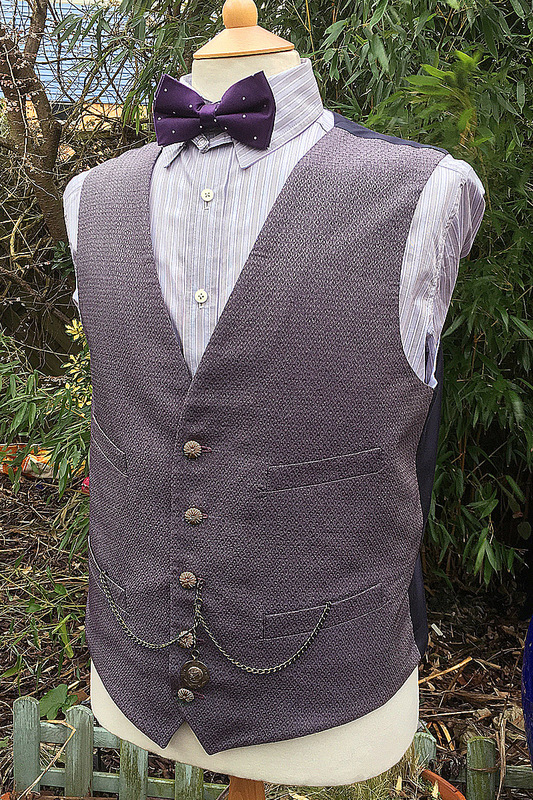 This is worn over a new charcoal fine Prince of Wales checked waistcoat; blue shirt; and a new deep purple and small polka dot bow tie. 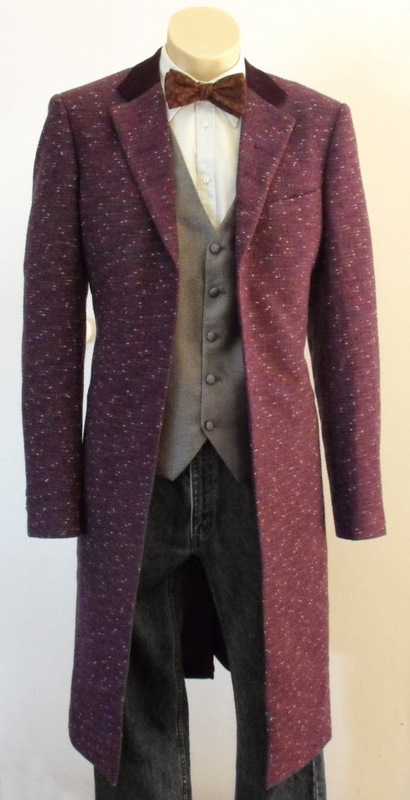 The trousers are a pair of his usual G-Star RAW; and he wears the purple boots to go with the frock coat. The picture at the top gives a good view of the boots, and how high they come up the ankle. 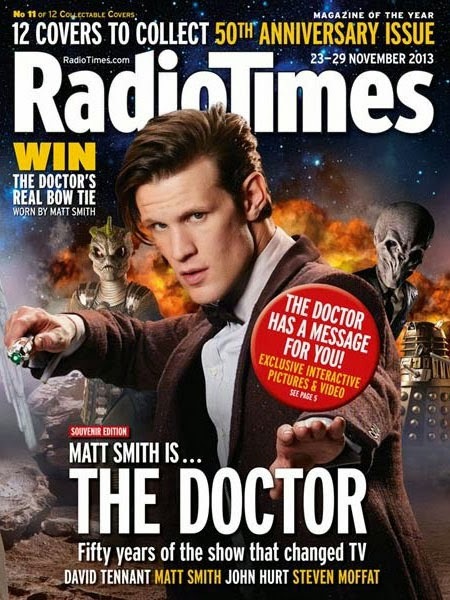 Must say I’m looking forward to seeing Matt in action again! Doctor Who Celebration - my tickets arrive! 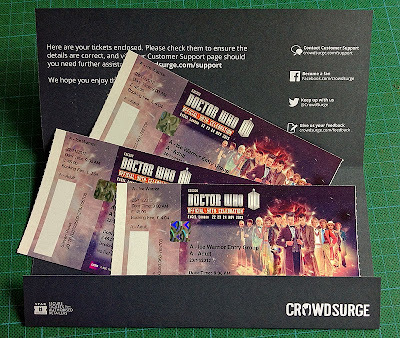 It’s only a couple of weeks til the Doctor Who Celebration, and my tickets have arrived. I’ve had a very busy week - been having a very busy couple of months come to that. 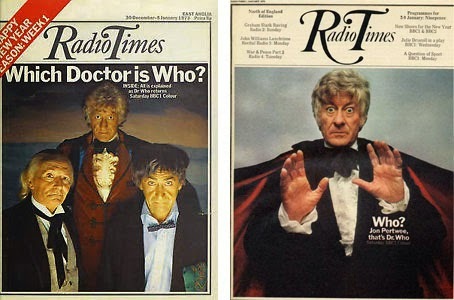 October has been manic for US clients wanting something for Halloween, and now I have a rush for the 50th Official Celebration - all on top of my usual bits and pieces I do. It’s funny sometimes how I don’t get asked to make a particular garment for ages, then I get a run of orders and find myself under a mountain of cloth. 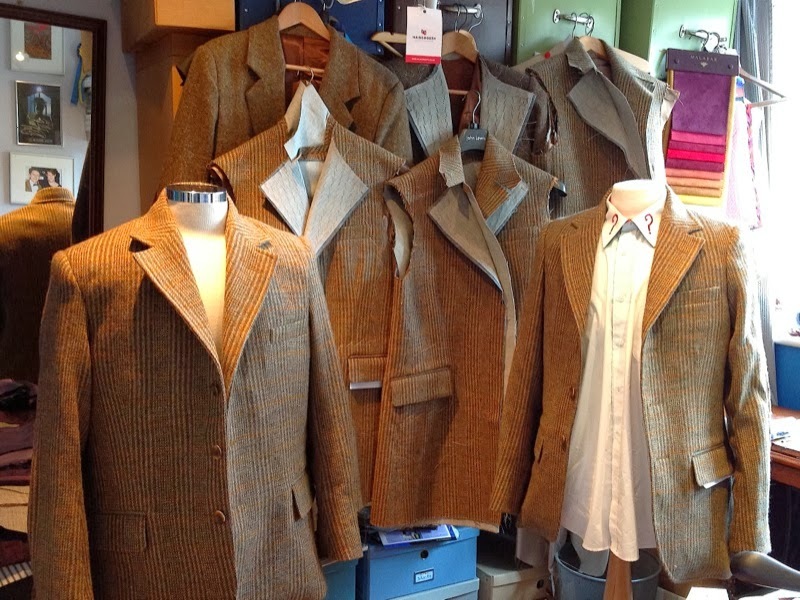 This month is seems to be tweed! 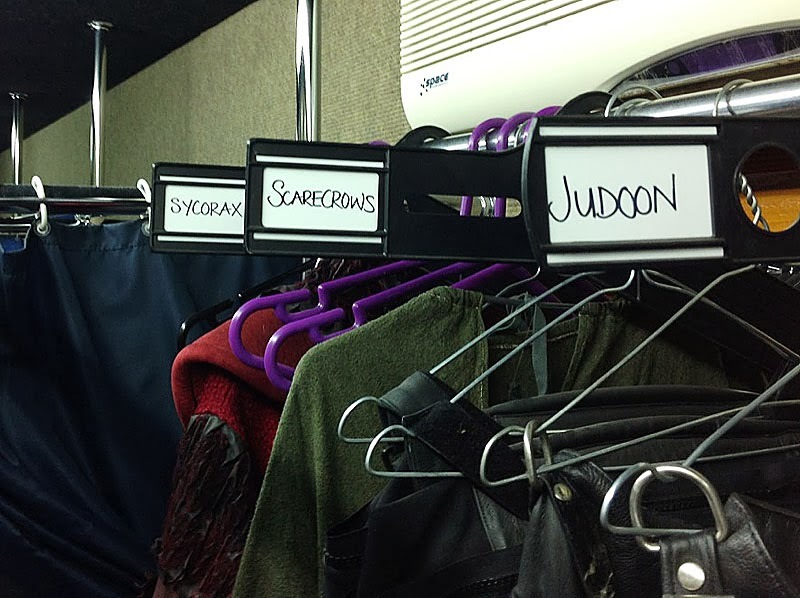 If you’re waiting on a jacket from me - it’s likely yours is one of those shown above! 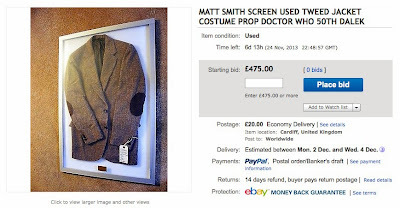 Matt Smith’s cashmere frock coat is becoming increasing popular. Personally I’m getting a lot of enquiries about it. For the choice of fabric, the best alternative option out there is the Abby Shot coat, though their pattern leaves a bit to be desired. 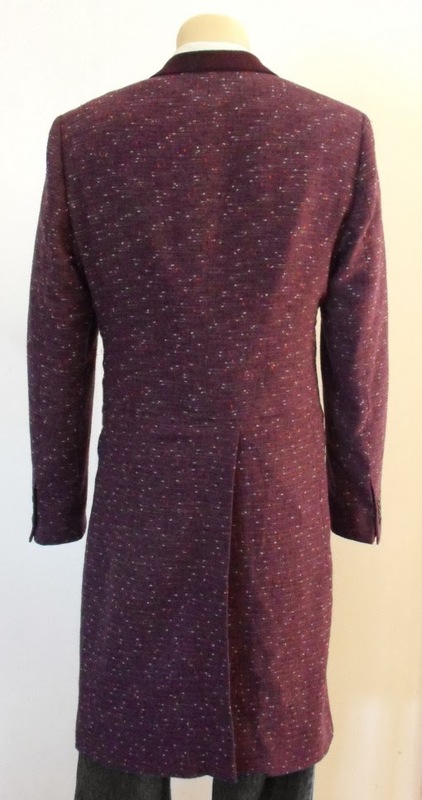 If you so desire you can order something that resembles the coat from a variety of eBay sellers from the Far East, all of whom will make you a coat to measure for as little as $100. 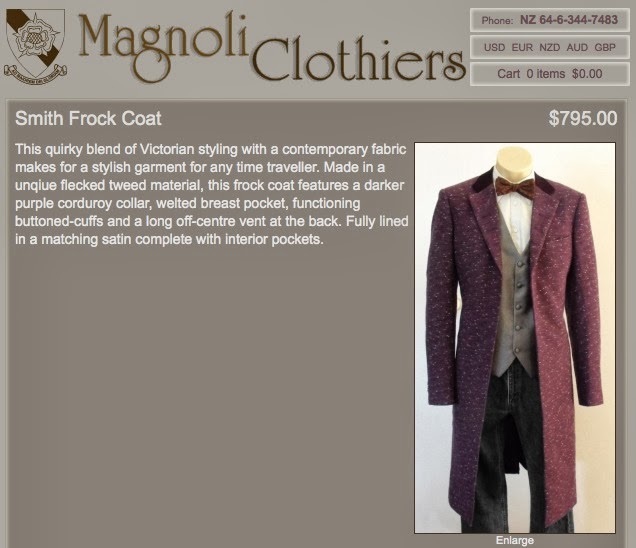 Another option is to order one from Magnoli Clothiers in New Zealand. 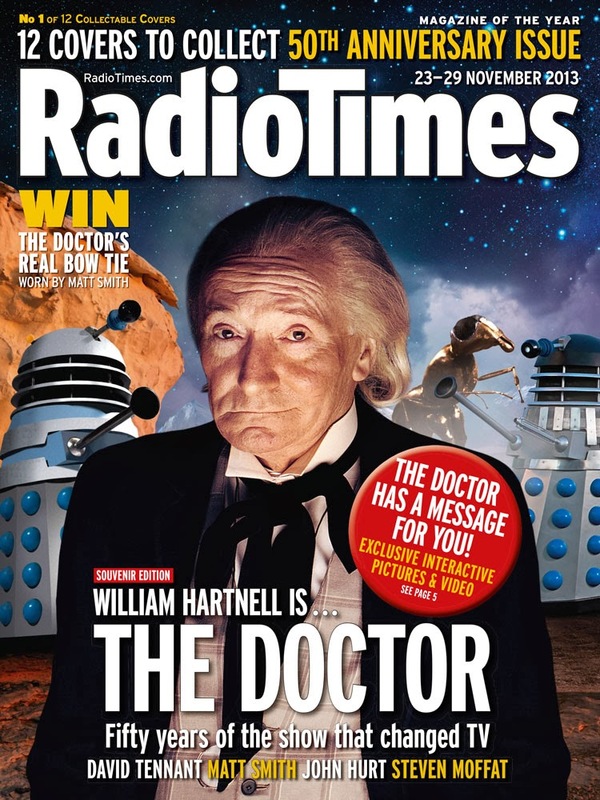 I’m afraid I don’t much care for this version. The length of the coat is almost a foot too long. It desperately needs to be hacked back. 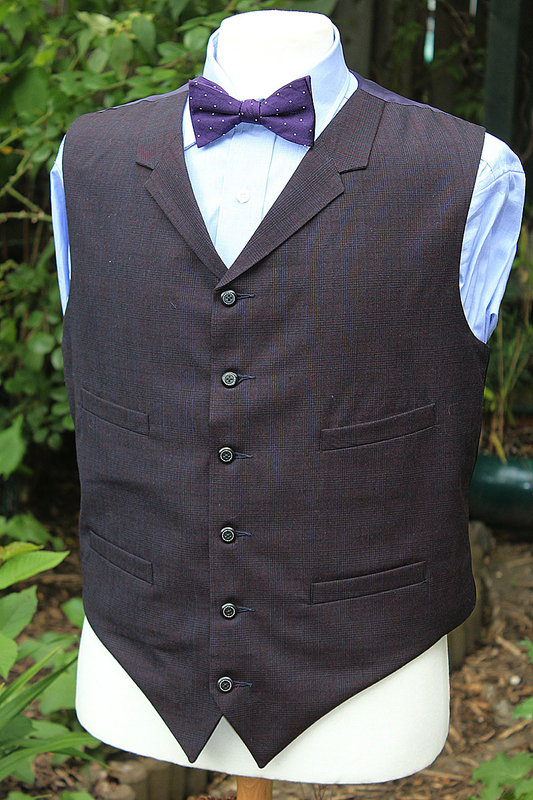 It’s difficult to tell from the photos, but I’m struggling to see the right number of buttonholes. There should be six on each since of the coat. The back of the coat lacks almost everything a frock coat should have. I can’t see the arched princess seams from the shoulders, and the skirt is in a single piece from the front edge to the back vent. 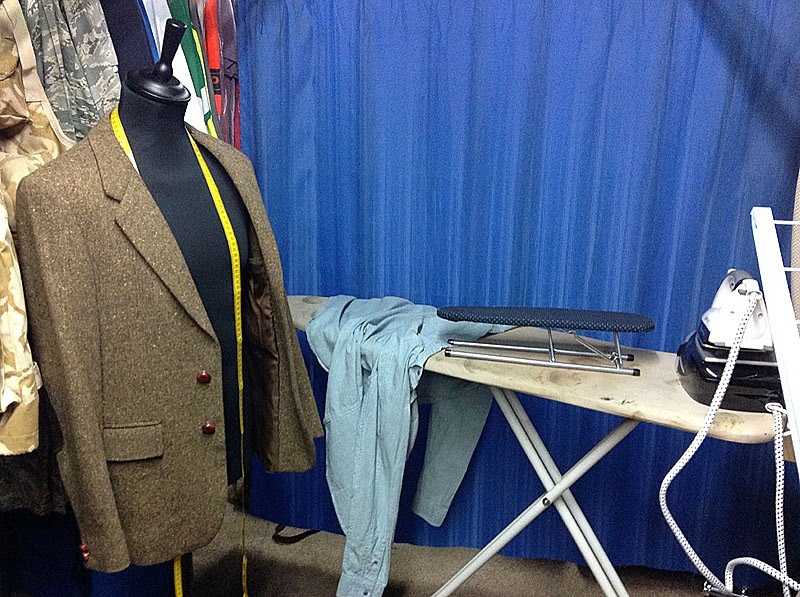 The top of the vent is too low, remembering that the coat is around a foot too long as well. 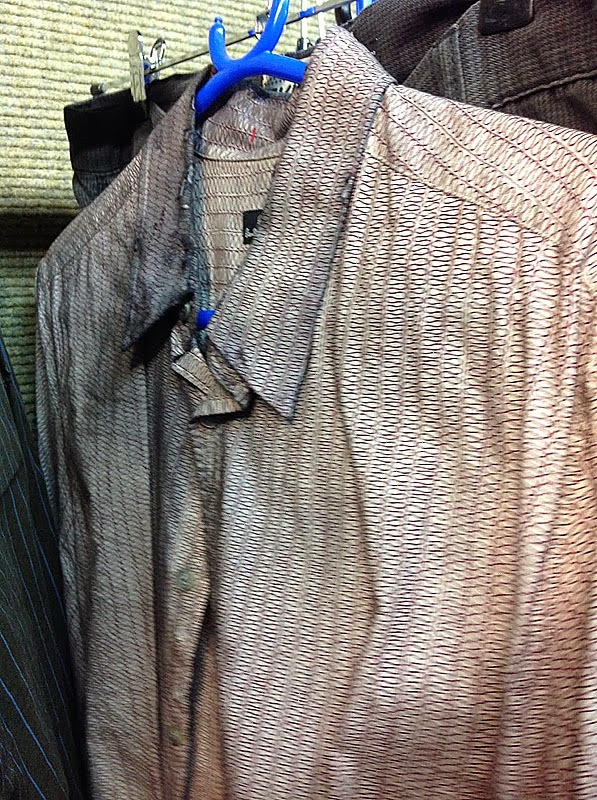 I can see why the fabric has been chosen. As well as being purple, the screen-used material has a shy-blue flecking which is very subtle. I know this has been a sticking point for a number of cosplay fans, who seem to fixate about seeing a flecking in the fabric. The choice, which undoubtedly has the flecking - in red and navy as well as the light blue - is at cost of almost everything else that needs to be right about the fabric. Not a very good attempt. Sorry. Radio Times special - win The Doctor’s Bowtie!